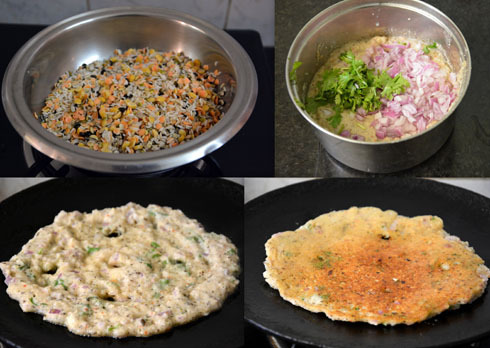 Pancharatna Dal Adai is a very healthy and simple dish made with five different variety of lentils and rice. It is easy to prepare and tastes great. I have already posted pancharatna dal recipe and pancharatna dal khichdi recipe, which you can check to know more about pancharatna dal. Today we will learn how to make panchratna dal adai following this easy recipe. Pancharatna dal* - Mix equal quantities of split black urad dal, split green gram dal, masoor dal, tur dal and bengal gram (channa dal). I usually mix all the dals together and store it. When I need to make panchmel dal or panchratna khichdi or adai, I take from the mixture, which is much easier. Now a days, you get ready made pancharata dal also. Wash and soak rice and pancharatna dal for 2-3 hours. Grind it with green chillies, ginger and salt adding needed water. The batter should not be too thick nor too watery. It should be of medium consistency. Add finely chopped onions, tender curry leaves, grated coconut and finely chopped coriander leaves to the batter. No need to ferment the batter. Heat a tawa, when the tawa is hot, spread a ladle of batter as shown above. 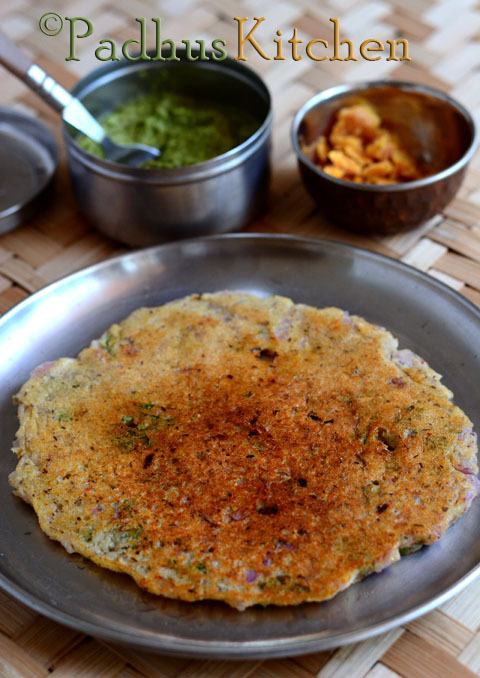 Make 3-4 holes in the adai and drizzle a tsp of oil around the adai and a few drops in the holes. When you find the corners lifting up, flip it over to the other side, drizzle another half tsp of oil and cook until golden brown on both sides. Remove from heat and serve hot with any chutney or sambar or aviyal. Thank you Janaki. You can use whole grains both black gram and green gram.Follow the same measurement. likes ur dishes very much.I have one doubt. can i powder all the dals and store in container for future use. Thinking it will be easy to make. if so how many days we can keep in refrigerator. I have not tried it so far - so not sure if powdering the dal will work out. Hi...Masoor dhal can be replaced by any other dhal..? Also which rice is better to use for this - idli rice or raw rice or ponni rice..suggestions? If you do not want to use masoor dal, replace it with tur dal or moong dal. You can use idli rice, raw rice or ponni rice or even par boiled rice. You may reduce the quantity of rice. Instead of white rice, you can add red rice or brown rice.